Sukkot symbolizes joy. It is a wonderful, pleasant, light, and simple holiday that people really love. The truth is that it requires preparation in advance, but still, it is very joyful. Why is that? First, after all the clarifications after the receiving of the Torah in Shavuot, after the 9th of Av when we saw how shattered we are—as it symbolizes the shattering of the Tablets of the Ten Commandments—it also symbolized the partition of the tablets. Then we reach the recognition of evil in the Jewish New Year (Rosh Hashanah, the beginning of the new year), and we make a decision that we must be corrected. And then comes the Day of Atonement (Yom Kippur), which in Kabbalistic terms is described as the embrace of the right and the left line, as the revelation of the properties of the court, Dinim (judgment) and Hassadim (mercy), the sweetening. Finally, there comes the festival of Sukkot, which stands for special corrections when I already can raise all my desires to bestowal. The Sukkah symbolizes this entire process. It is all very simple. I use my simplest desires in the form of branches and leaves for building a temporary home. They are worthless, but it is through using them that I build my temporary home, a Sukkah, that provides a shade over my head. The Schach (the covering of the Sukkah) is made of worthless materials that can be found everywhere. I am happy since I have managed to build a Masach above me which enables me to conceal the upper abundance and remain in the shade. I, on the other hand—with the help of the Light that Reforms, of course—can hide from the pleasures in the spiritual vessel. This process continues and I correct myself more and more in my vessels as they develop. I stay in the Sukkah with them, which means that I can open them and use them thanks to the Schach. Then, I reach Simchat Torah (Joy of the Torah). The Torah is the Light that Reforms that I received on Shavuot. I use this force to correct my vessels and now I come out of the Sukkah. In other words, I already have an unlimited Masach and I don’t need to worry about the Schach (canopy) anymore. Coming out of the Sukkah (“hut”) symbolizes that now I am free to roam around all of reality all over the world. There is no need for a Masach over my head anymore since it is inside me now. I now sit in my vessel corrected. Rabash, Letter 36: Sukkot resolves all the questions even the most difficult ones and bad since we know that Sukkah stands for the shade of faith that should prevail over the sunlight, that is over knowledge. “Its shade should be more than its Light.” However, we should make great efforts to receive the shade and to say that it is the shade of Holiness since this whole shade comes from Heaven and not from the Sitra Achra (the other side) and it was given so that a person would have a place to accept faith. What is important is that the force of the group is opposite to our ego. If it isn’t so, a person falls and sinks deeply into his ego, into his thoughts, and has no hope to succeed. One must constantly hold onto the right thoughts, to keep himself above, in the right awakening, holding onto the right force in the right direction, sustaining himself. This is possible only with the force of the group and its ceaseless help. There is no other way. We must take care of that. After all, most of the time, we still are absorbed in ourselves. However, if I don’t disrespect my friends and they have a strong affect on me, I wake up and transcend myself. This is a real problem. I can build a shade only if I am strongly impressed by the environment and consider it more important and stronger than my own nature. This is an inevitable struggle and I must constantly be concerned as to who is going to win this struggle. I have to see myself as a battlefield in which there is constant fighting between the shell and holiness. How can I promise myself that from now on the group will impress me more than any of my egoistic claims, attributes, desires, or thoughts? How can I be under its strong and faithful impression all the time? My future is secure only if I succeed in doing so. So, the more we work on the connection between us, the greater chances we have to succeed. Question: What helps us win this struggle other than simple luck? After all, I constantly see that I definitely am losing this battle. Answer: You will always lose. You can only win on one condition: if you make sure that the friends do not succumb to their nature. My influence on them should be stronger than their nature which pulls them downward. So I influence them by inspiration, impression, and the importance of the goal. A mother also constantly thinks of her children no matter where she is and what she does. In order to do so, we must work on mutual guarantee. We are all in the same boat, and we all will drown if someone drills a hole in it. It is all in our hands, and only we can fulfill this. There may be blows that will help us understand that we are really in the same boat. Question: I constantly feel that I am absorbed in myself and not in the group. How can I shatter the illusion that I operate by myself? Answer: You must keep on trying. Worrying about yourself won’t help, of course. However, by that, you at least will see that it doesn’t help and that there should be mutual concern for the friends. We need one, big, common vessel that includes all our friends in Israel and abroad and, of course, to make more efforts. There will be different disturbances along the way but they will be revealed as help against you, and then you will begin to think twice about how to be and what to do. Eventually, you should understand that, if you don’t want to connect, you will be sent more disturbances that can tear you to pieces, throw you in different directions, and put you into different problems. The only thing you should do on top of all these interruptions is to connect. This is the answer to all the future, external disturbances that will come so that we will reach the right connection. Question: However, waiting for the disturbances is the path of suffering. Answer: If you overcome them both on the corporeal level and on the spiritual level, then it is fine. Spiritual development is in feelings because the material of creation is the desire to enjoy. And we can use the mind only on condition that it helps us to correct desire. Otherwise, it can hurt us. Therefore, it’s said that “there is none wiser than the experienced.” That is, first you need to go through all kinds of feelings and impressions in your desire to enjoy and then from this you obtain wisdom. We cannot work in the mind with what we have not experienced in our desire, that’s called philosophy, which has no real basis. After all, everything is based on the material of desire. States are changing every second because, if a state does not change, then time is not moving. Any state changes due to the fact that first we cancel ourselves before the influence of the Light. All the work is done by the Light: The Light is primary. It creates a desire, affects, and changes it. We are only required to accept the action of the Light, let it enter, we express our consent, a request, a prayer, to persuade it to do its work. It all depends on our state: whether we demand like babies or ask like adults. There are many types of relationships between the Light and a person, or rather, the desire for the Light, asking the Light to influence it and make some action on it. Why is it necessary that the desire turns to the Light and asks it to act? Because through this, the desire understands what the Light is going to do and agrees with this. It acquires intelligence, the head, and makes itself similar to the Light. It cannot perform the action itself; the action relates to the work of the Creator, but because of this, the desire grows until it becomes equal to the Light. My task is to draw the Light on all the actions that I want done to me, and the Light performs everything. Every request like this begins from self-annulment: I want that a change to be made in me, but don’t know exactly what. After all, this will be a new state, I cannot recognize it or see in advance. It’s impossible to talk about something that I have not yet reached, so I need self-annulment, and I ask the upper one to make this action on me to save me. I don’t know what He will do and into what He will turn me, what I will become in a moment. Even if the head and the body change, that is, the thought and action, everything, so that I would not recognize my former self as I was a second ago, to such an extent that I would become an entirely new creation. I don’t care what I will become, it’s most important for me to give myself to the Light so that it would perform its action. I have to be ready for this and wish more than anything else to want to cut myself off from all of the past so that nothing is left from the past, and I would not see a single old property in myself and even that there would be no transition between the past, present, and future. Only then it means that I am ready for the impact of the Light on me. It should not come from the desire to escape from the previous state. I am asking to be changed not because I feel bad. I don’t ask to be saved from problems as that would be a selfish request instead of the advancement to the next spiritual level. I ask one thing: Help me become like the Light, to become somewhat similar to it, to become a giver for someone. All that I can clarify is only in the group with respect to the friends, to humanity. Thus I am preparing myself for the true prayer. I am looking for it because I don’t know what this feeling should be. So, I search, work, study, disseminate, do everything I can. You have to be sensitive to what you are given to advance toward the burst of the true prayer, which leads to the answer to it from above. Thus I come to self-annulment, the feeling of joy, solidarity, loyalty to the Light, which is called the devotion of the soul. I know that everything it will do to me will be correct. And it is not because I want to run away from troubles and I have no other choice, but on the contrary, I am fine and have no shortage in anything. I lack only one thing: handing myself to the Light and becoming included in the quality of bestowal so that it would rule over me and allow me not to think about myself but to be loyal to that one property. This is called the correct prayer, the request for the first action of the Light, which is the beginning of the spiritual embryo. After that, a person begins to feel his connection with the Light to the extent that he feels like a drop of spiritual seed that must cancel itself inside the property of bestowal. This starts a long process of spiritual growth of the embryo that passes in constant self-annulment relative to the Light, which every time passes more properties of bestowal to the embryo. The entire spiritual path, the entire ladder, birth, suckling, and maturity, is the acquisition of additional properties of bestowal over the previous state. Thus the soul grows. Don’t Do Any Work That Isn’t Yours! It is said: “The Cup of blessing should be filled to the brim.” In order to make the Light work on me, I have to ask the Light to do so from out of all my desires that it has to correct. I don’t know what kind of desire this is and about what part of myself I ask, but it must be the full measure. I don’t know how it happens and whether I am going in the right direction to find the necessary desires. I just have to constantly work to give myself to the thoughts, desires, and actions of bestowal as much as possible, and to be included in the group until I come to the right cry organized for me by the Creator. The true prayer is already a consequence of the influence of the Light. After all, we ourselves do nothing, but preparation. The prayer itself is the result of many preliminary steps and preparation, the prayer before the prayer. The Light gradually affects us by small illuminations in the dark, in the states of helplessness and powerlessness until our despair reaches the limit when the person is ready to do anything to become a slave of bestowal, which will rule over him and fill his entire mind and heart. “The study finds that social cohesion is strong in the wealthy Scandinavian countries Denmark, Norway, Sweden and Finland, whereas it is weak in the southern European countries hardest hit by the economic crisis, with Bulgaria, Greece and Romania at the bottom of the list… . “Solidarity (social cohesion) is important for shaping the future of a society, ” said Liz Mohn, deputy chairperson of the Bertelsmann foundation, as she presented the study in the western German city of Gütersloh on Tuesday. “Solidarity has a positive effect on individuals in society. More solidarity means a rise in subjective well-being,” she added. Sociologists at Jacobs Bremen University gathered relevant data from 34 countries going back 25 years. “The countries include European Union countries, as well as other members of the Organization for Economic Cooperation and Development (OECD), such as North America, Oceania and Israel. “Germany is in 14th place, just ahead of Great Britain and France and well ahead of the Baltic States, but below the United States, Canada, Australia and New Zealand. My Comment: The forces and connections that emerge in the process of integral education will be able to change any society quickly and bring it to cohesion up to the feeling of brotherly dependence and love. Intention is the only thing that depends on us. Galgalta ve Eynaim (GE) in Israel, those who aspire directly to the Creator (Yashar El), has nothing but intention. GE doesn’t actually need anything except intention since it represents a liaison between the lower one and the upper Upper. The Upper is in a state of smallness (Katnut); the only thing that the lower one has in its possession is a Reshimo and the upper Upper is in the state of adulthood (Gadlut). At first, illumination from above awakens the lower one’s Reshimo; then it raises its demand to the Upper. The Upper directs the Reshimo to his Upper, and in return the upper Upper sends the Returning Light to the Upper. 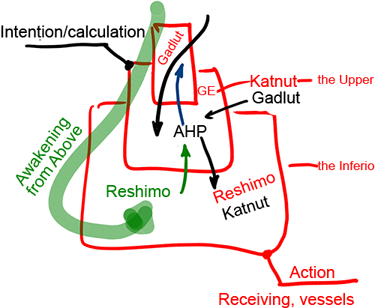 Then, the Upper enters a state of adulthood (Gadlut), acquires AHP, and begins influencing the lower by transforming it from a “single-point Reshimo” into a state of smallness. Thus, the Upper in essence is the intention of the calculation, whereas the Lower is the action, a state of receiving, a vessel, a desire. Accordingly, both states of smallness and adulthood in the Upper refer specifically to the intention, to its essence: a small “donkey” and a big “donkey,” a small man and a big man. The intention that the Upper builds varies depending upon the request that it receives from the Lower. One way or the other, the Upper Galgalta ve Eynaim and AHP get “synchronized” with the intention. Israel doesn’t perform this action; Israel only directs the commonality. This explains why we are obligated to manage unity among people. Otherwise, where will they get the force for this? If they find the strength to unite without our help, it would turn into a “gathering of disdainers” or an “assembly of criminals” and would cause a lot of harm. That’s why we have to clearly and firmly work with the world so that everybody understands what we are doing. We explicitly clarify that it’s our special methodology. Other than us, nobody can attain positive results by just copying our method. On the contrary, if they persist, in a half a year to a year, their attempts will lead to negative results. Our methodology has nothing to do with mysticism or coaching, or anything else like that. It is unity that we build with the help of the upper force. Others can claim similar ideas, but this methodology is solely ours. It must be utterly clear. Only our friends who are trained and qualified will be able to lead people to unity, since they themselves are united into groups, work on enhancing unity with their friends, and are connected with the upper force through their teacher. So, they are the ones who can be the conductors of this process. Moreover, we acknowledge that there is a group within the Upper, but let’s talk about this next time. From an article by Baal HaSulam, “The Secret of Conception and Birth,” part 7, “Movement as a Sign of Life”: From the aspect of spiritual life, we divide the creatures into two groups: still, vegetative, animate – and speaking. The still, vegetative and animate are completely dead. The speaking is the aspect of life. Life is the power to move. And it is known that the beginning of life is made by two actions that are opposite in purpose. On the levels of the still, vegetative, and animate activities like these don’t take place and also among people who are found on the developmental levels of the still, vegetative, and animate, but only in someone who has already reached the level of the Adam within a person. For also the speaking, when born he is really dead until they awaken him through urgency. This is what we feel on our way. Certainly this is not talking about the birth of the physical body, but about spiritual properties. Even when Adam is born, which is to say when a characteristic of “resembling” (Domeh) the Creator begins to be developed in one of us, in the beginning this is in the aspect of being “dead”; he is not ready to carry out his own actions. And he remains so until they awaken him through urgency and pressure. For his Kelim, vessels, are ready to receive life and movement while still in his mother’s womb; that is, it is still included within the higher level before obtaining independence and a feeling of self. And when he comes into the air of the world, the air of the world acts on his flesh with a coldness to which he is not accustomed, and this causes the arousal of contractions. And this coldness forces him to contract, to stop. We are never ready for coldness that comes from the next state, and so we contract. That is, it is up to the person to feel how much his intellect and emotion don’t operate in that area as before; rather they contract and withdraw. He is really weak and is not ready to do anything, he has no power, no brain, and no inner strength, he is not prepared to perform, to understand, or to feel anything. This means, he reaches a contraction of the first breath. And after the first contraction, he is compelled to extend again to his previous dimension. A person doesn’t know if this is his previous dimension or not. It is difficult for him to measure these boundaries and depths for everything is already taking place within the new Kelim. From the moment he contracts until he returns to fill that space with the understanding and that emotion that he had, he has new Kelim in him. And these two processes—contraction and expansion—are the first step toward life. But sometimes the newborn is so weak that the cold air of the new world does not make it contract, and so he is born dead. This is like a student who feels unpleasant under pressure and can’t stand it and take it to the contraction. And so he goes out of this state spiritually dead, and he remains only in the physical, animal body. After all, he did not create the place and the reason for life to be clothed in him, whose origin began from the power of the contractions. From the contraction, he could not expand to the previous place. To the degree that a person is ready to contract, to understand, and to experience this state, to accept it with gratitude, he can expand again. And he doesn’t expand to control his state, to raise his self-esteem, and to get rid of fear but in order to vacate a place for the Creator so that He can fill him. Through contractions and expansions, all the changes in the spiritual levels take place, at every step. One constantly goes through such pulsations and the only question is only how he uses them, how he relates to them? And here the sign that the creature is ready for the Light of life is that there is at least a power in him to make a contraction so that the Light of life comes to him and makes an exhalation. And the first movement of life is made. The Light that Reforms arrives, and this expansion back to the previous place gives him the first characteristic of bestowal. Therefore he doesn’t stop moving and becomes alive. And therefore the movement will not cease in him anymore; and it becomes a living movement.